MAKE BABY'S FOOD IN 15 MINUTES OR LESS WITH BABYCOOK! 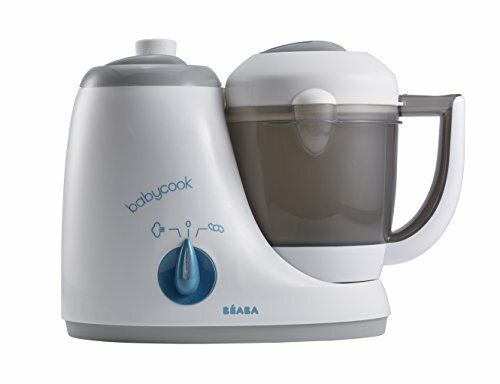 Babycook, is a one-of-a-kind, patented compact countertop appliance that functions as a steamer, blender, warmer and defroster to prepare fresh, healthy meals for baby. Quickly steam cook vegetables, fruits and meats in 15 minutes or less, while preserving their vitamins and flavors. By saving the condensed water after steaming, you're able to add valuable nutrients back into baby's food. Parents can also use BABYCOOK to quickly reheat or defrost precooked foods. Clean up is quick and easy with a top-rack dishwasher safe bowl and basket. Bowl is made from unbreakable, BPA-free Polypropylene and the cooking basket from transparent polypropylene (PP). Since 1989, Beaba has been widely recognized as a world leader in creating innovative children's products. Through a commitment to design, innovation, and technology, Beaba creates the most beautiful and functional children's products in the world. Comes with a cooking basket, spatula and recipe booklet.